During the Draping Class in the 2nd semester, the task was to create a garment out of the basic geometric forms: squares, triangles and circles were gathered, pleated or cut in order to shape the dress. This is sewn out of mold an untreated, raw cotton. Usally mold is used for draping, because it’s a cheap material. In this case the focus should be on the design itself and not on color or structure of material. So the colorless, plain woven cotton suits perfectly, that the design isn’t distracted. The skirt consists of nine triangles wich were pleated symmetrically. Two of those pleated traingles are also on the front upper part. 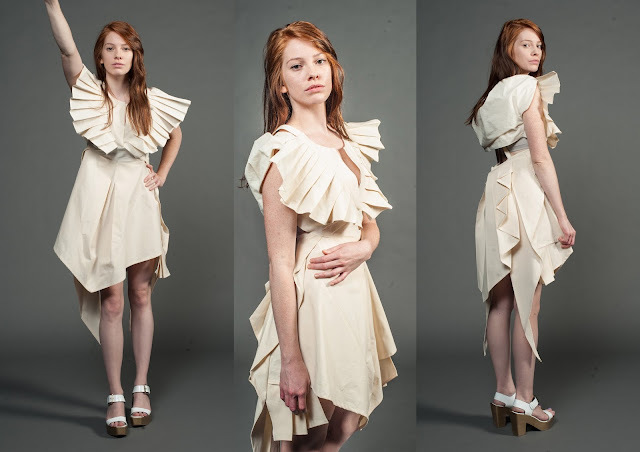 The back stands in contrast to all the clear pleats: There is a fluffy cloudy voluminos triangle. All in all you can compare this contradiction to a holy image of Jesus: The pleats symbolise the halo, the cloudy back stands for the clouds where Jesus comes from and still lives.